ST. GEORGE – National Park Service rangers are searching for a Utah man reported missing within the Grand Canyon Tuesday. Michael Legus, 39, of Tooele, was reported missing by a friend. Last seen at Mather Point on the South Rim at approximately 12:15 p.m., he was headed in an unknown direction, according to NPS officials. He was wearing a blue, hooded sweatshirt and blue Levi jeans. Missing since: Oct. 31, 2017. 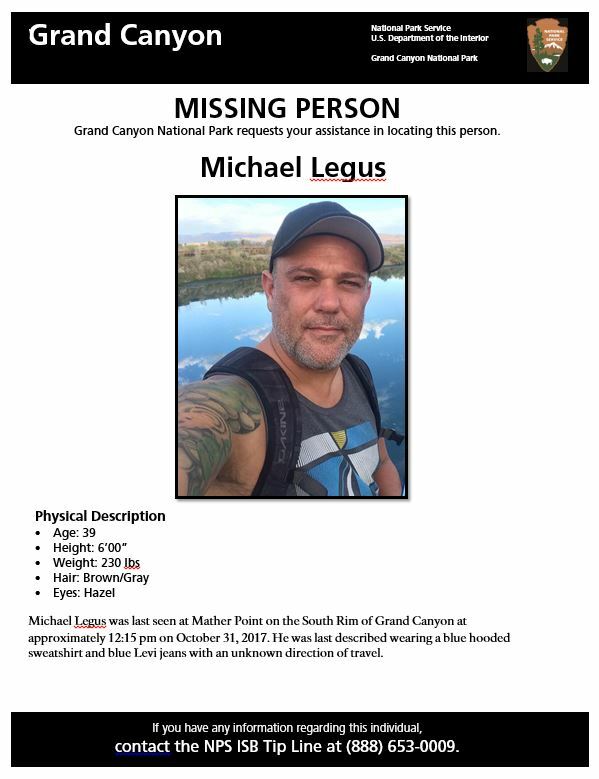 NPS rangers are searching the area and ask anyone who may have seen or talked to Legus to contact the National Park Service Investigative Services Branch tip line at 888-653-0009. A missing persons investigation is ongoing. No further information is available at this time.